Baskin Robbins an Ice-cream factory was setup in 1945 by IRV ROBBINS and BURT BASKIN, who were brother in law. Robbin was the son of the owner of a dairy business in Tacoma, Washington. The dairy included an ice-cream store. Robbin spent his time managing the store & bored with flavor like Vanilla & Chocolate. He tried to liven up by new flavors with fruits & candy. Now Baskin – Robbins known as America’s favorite sweet chain. It discovered an innovative way of Marketing with movie release. The objective of this assignment is to find out mission & vision statement, Identifying the external opportunities & threats, internal strengths & weaknesses. Then go for SWOT analysis. At last strategy evaluating & choice one. By this case analysis we can understand company’s financial condition. It shows the future of company. It can also motivate managers & employees to contribute for the welfare of company together. Irv Robbins opens an ice cream store in Glandale, Californis called “Snowbird”, which proudly featured 21 exotic flavors. After opening six ice cream stores, Baskin and Robbins license operations of the store-giving birth to the concept of franchising in the ice cream industry. “Beatle Nut” ice cream signs the praises of Beatle mania. As Americans tune into Laugh-in, Baskin-Robbins holds court with Here Comes The Fudge. The London based J. Lyons & Co., Ltd. Purchases Baskin – Robbins. Baskin-Robbins Incorporated is formed and under its umbrella are two new subsidiaries, Baskin-Robbins USA, Co., and Baskin-Robbins International. Baskin-Robbins introduces a 93% fat-free “light” ice cream. Baskin-Robbins is named “America’s Favorite Sweets Chain” for the 10th time in Restaurants and Institutions prestigious national survey’s 13 years history. BR Smoothie is introduced, making Baskin – Robbins the nation’s largest seller of Smoothie beverages overnight. ADRUSA and ADRI come together as the integrated Allied Domecq Quick Service Restaurants. Nearly three million people walked away with smiles during Baskin-Robbins “Free Scoop Night”. Joe Adney, Senior director of Marketing at Baskin Robbins. Jack Shafer, CEO of ADQSR, parent of Baskin Robbins. (a) List the key external factors. Include 10-20 factors both opportunity & threats. (b)Assign each factor weight from 0-1.0 that indicates relative importance. The sum of all weight of factors must equal to 1.0. (c) Assign a rating between 1 & 4. Each factor indicates how effectively current strategy respond to the factor. (d) Multiply each factors weight by its rating to determine weight score. (e) Sum of the weight score to determine total weight score for the Organization. 01 Increasing worldwide demand of customer. 02 Diversify with other food products. 03 More research over the world. 05 Merge with other food products area basis. 08 Low demand in winter oriented countries. 09 Competitors are well diversified. 10 R & D is conducted over the people in USA. 11 Competitors are established in other countries like Bangladesh. 12 Advertisement is high expensive. List the key internal factors. Include 10-20 factors both opportunity & threats. Assign each factor weight from 0-1.0 that indicates relative importance. The sum of all weight of factors must equal to 1.0. Assign a rating between 1 & 4. Each factor indicates how effectively current strategy respond to the factor. Multiply each factors weight by its rating to determine weight score. Sum of the weight score to determine total weight score for the Organization. 01 Variation of flavor (over 1000). 02 Sample supply to taste before purchase. 03 Becoming a regular part of the menu. 05 Serving 150 million ice cream cones a year. 06 Introducing fat free ice cream. 07 Well advertising time to time. 08 Location of the stores is not always convenient. 09 Expensive for the third world countries. 10 R & D is expensive. 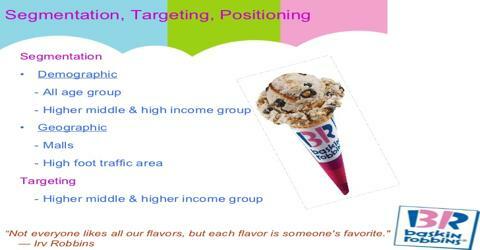 BASKIN-ROBBINS was one of the first ice-cream companies to undertake marketing in a big way. The company successfully positioned itself by creating and offering flavors which were not available anywhere else, combined with good store ambience to lighten the theme of a ‘fun outing’. The company’s marketing policies helped it stay successful in over six decades of operation.